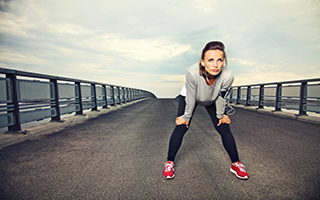 In the past, I've told you about how great interval training is for your health. When many people hear "interval training," they think of running. And you can certainly get great results by incorporating intervals into your running routine. But what if you can't run? Can you still experience the benefits of intervals? New research out of The Ohio State University says that you can. One of the benefits of interval training is that it burns extra calories, and according to this study, published in Biology Letters, varying your walking pace can burn up to 20% more calories than maintaining the same speed. What's interesting is that this isn't simply because walking fast requires more energy. The researchers found that the act of changing speeds itself causes your body to burn extra calories. In fact, up to 8% of your calorie burn during your daily walking could simply be from the energy it takes to start and stop walking. One of the authors of the study, Nidhi Seethapathi, is a doctoral fellow in mechanical engineering. He explains the reason for the extra calorie burn this way: "Walking at any speed costs some energy, but when you're changing the speed, you're pressing the gas pedal, so to speak. Changing the kinetic energy of the person requires more work from the legs, and that process certainly burns more energy." In order to measure the calorie burn that comes from changing speeds, the researchers asked participants to walk on a treadmill and vary their walking speeds. But rather than adjusting the speed of the treadmill belt, the participants were to simply speed up, moving closer to the front of the treadmill, or slow down, walking closer to the back. When the treadmill belt speed changes, the treadmill itself does some of the work of changing the pace, making it harder to gauge the calorie burn of people walking in the real world. This method forced the participants to do all of the work themselves, even though they were on a treadmill. The researchers also found that people walk more slowly when they have a short distance to go and more quickly when their destination is farther away. So consider making a speedy trip even if you don't have very far to go. Researcher Manoj Srinivasan also heads up the Movement Lab at The Ohio State University and had some additional tips for burning more calories while you walk: "Just do weird things. Walk with a backpack; walk with weights on your legs. Walk for a while, then stop and repeat. Walk in a curve as opposed to a straight line." You might get some strange looks while you exercise, but these are all good tips. If you'd rather be less conspicuous, varying your speed is a great way to increase your calorie burn while getting some exercise in. Whatever you do, get moving. It doesn't have to be fast. It just needs to vary.